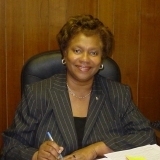 Gloria A. Crutchfield has been in academia for over 35 years and retired as an Area Director from the School District of Palm Beach County, Florida in 2013. Gloria was responsible for: consulting/coaching administrators; conducting pedagogical reviews; and developing and implementing comprehensive action plans for Alternative Education/DJJ schools and Charter schools. She was also responsible for conducting pedagogical reviews and for providing district-level support services to a school in intervene status, and worked directly with a team from The Florida Department of Education to successfully raise the school academically. Dr. Crutchfield was district director of the Superintendent’s Task Force Initiatives and worked directly with principals, administrators, and stakeholders to strategically plan, through consensus, to reduce suspension rates and to increase graduation rates of African American and Latino males. Dr. Crutchfield has participated on numerous panels, most notably the 54th Annual Fall Conference of the Great City Schools in Tampa, Florida. There, she participated as a panelist on African American Male Achievement. She was an invitee for the Florida Council on the Social Status of Black Men and Boys; a quarterly meeting addressing the issues confronting Black men and boys at the local, state, and national levels. Gloria launched the K-24 Continuum Academic Partners, LLC in June 2015. The mission of this educational management organization is to share expertise, research-based best practices, and to collaborate with other educators, i.e., school district personnel on, but not limited to, leadership development, organizational development, program development, teacher development/evaluation while building effective life-long learning communities in underperforming schools on a national/international level.